In their NHL 16 Stanley Cup Playoff Simulation, EA Sports is predicting that the Washington Capitals will defeat the San Jose Sharks in seven games to win their first Stanley Cup. Conducted in-game using NHL 16 and real-life data from NHL players and teams, factoring in matchups, player ratings, line combinations, injuries, and hot streaks, the simulation also predicts that Capitals goalie Braden Holtby will take home the Conn Smythe Trophy as playoff MVP. 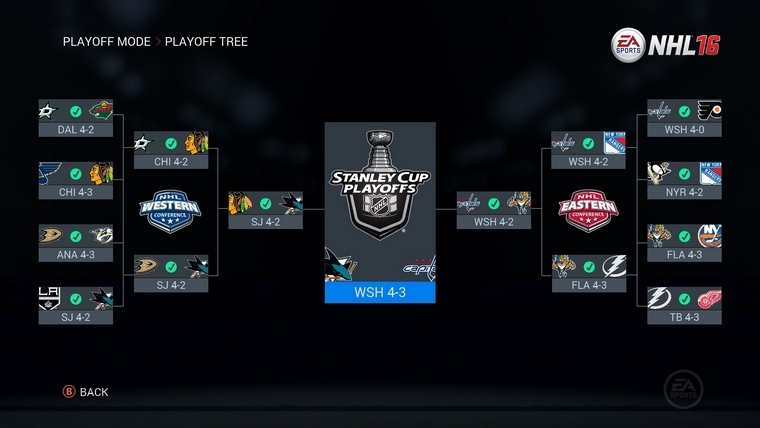 Other highlights from the simulation include Alex Ovechkin scoring 15 goals in 25 games, the Sharks defeating the Chicago Blackhawks in the Western Conference Final, the Capitals defeating the Florida Panthers in the Eastern Conference Final, and the Penguins losing in the first round. Who do you think will win the Stanley Cup this season?